Racialized workers experience higher rates of unemployment and precarious work. 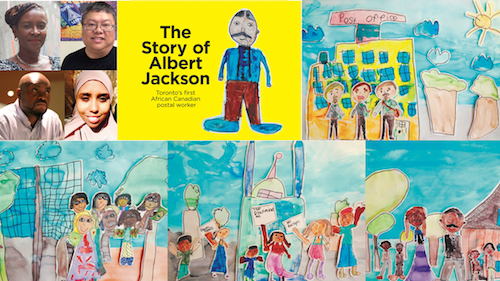 We are making a link between the Albert Jackson story of 1882 and the intersection of racism and precarious work today, as Canada celebrates 150 years in 2017. 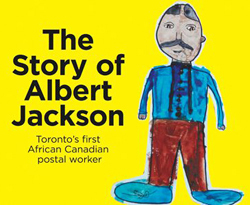 This event will see the launch of a new picture book by and for children about the story of Albert Jackson, Toronto’s first black postal worker who faced racism from the other postal workers. In 2013, the Canadian Union of Postal Workers’ national human rights committee honoured Jackson with a commemorative poster. Members of CUPW continue to fight for dignity, respect and fairness in the workplace, as pressures increase to ensure the public sector labour market follows the spread of precarious work in the private sector. Following the book launch is a panel discussion moderated by Itah Sadu (A Different Booklist) and featuring Maryama Ahmed (Jane Finch Action Against Poverty), Mark Brown (Canadian Union of Postal Workers), and Kingsley Kwok (Ontario Public Service Employees Union). Co-presented with Ontario Black History Society, The Elementary Teachers of Toronto, Toronto Workers’ History Project and co-sponsored by CUPW.